This Southern tomato gravy is incredibly delicious, and it is amazing on split, buttered biscuits. 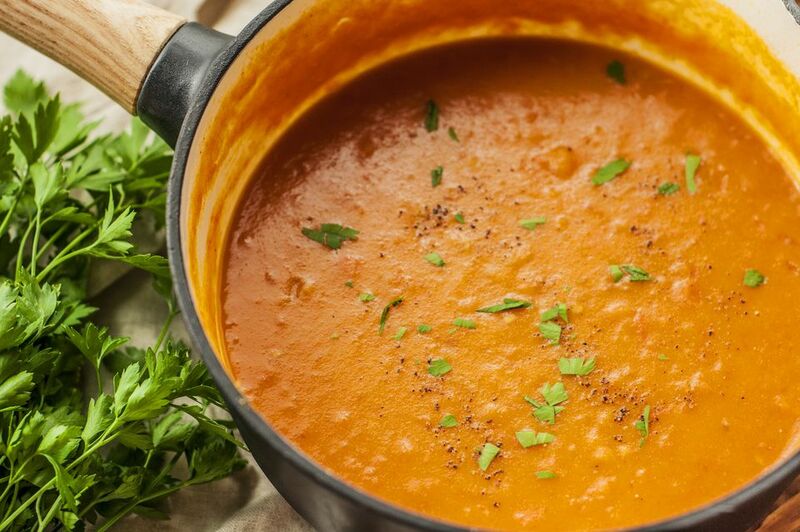 The tomato gravy is also an excellent way to use garden-fresh tomatoes. Bacon drippings or butter and flour make the roux for this simple tomato gravy. Serve the gravy over freshly baked biscuits, mashed potatoes, rice, or pasta. The sauce would be delicious with cooked green beans or slices of meatloaf as well. It's also a versatile sauce with lots of possible flavor additions. See the tips and variations below the recipe. A few tablespoons of tomato paste was included in the sauce (pictured), but if you are using garden-fresh tomatoes in season, the extra flavor boost might not be necessary. Some milk or cream makes for a creamy sauce, but stock or water may be used for a lighter sauce. Put the chopped tomatoes in a saucepan with 1 cup of chicken stock. Place the saucepan over medium-high heat and bring to a boil. Reduce the heat to low and continue to simmer the tomatoes while you prepare the roux. Put the butter or drippings in a medium saucepan and place it over medium-low heat. When the butter has melted and the foaming subsides, add the flour. Cook, whisking constantly until the roux is just light brown. It should be about the color of peanut butter. Don't let it burn. Remove the pan from the heat and gradually stir in the simmering tomato and broth mixture. Return the tomato mixture to the heat and stir in 1/2 cup of milk, cream, water, or chicken stock. Whisk in tomato paste, to taste, along with kosher salt and freshly ground black pepper. Cook, stirring until hot and bubbling. Serve the gravy over hot baked and buttered biscuits or use it as a sauce for pasta, rice, meatloaf, grits, or potatoes and garnish with a sprinkling of chopped fresh parsley and more pepper, if desired. If you would like to learn more roux preparation, see How to Make a Louisiana-Style Roux. Substitute 1 can of good quality diced tomatoes or stewed tomatoes (finely chopped) for the fresh tomatoes. Add 1/2 teaspoon of onion powder or a few tablespoons of finely chopped onion to the simmering tomatoes and chicken broth. Add a few tablespoons of finely chopped bell pepper to the simmering tomatoes and chicken broth. Add 1 small clove of finely minced garlic or 1/4 teaspoon of garlic powder to the simmering tomatoes. Chop a rib of celery and add it to the simmering tomatoes.